Microsoft PowerPoint APK 16.0.7625.1000 beta is a good news for everybody, primarily for those of you who frequently need to be in touch with seminars, workshops, conferences, or even as simple as a corporate meetings. 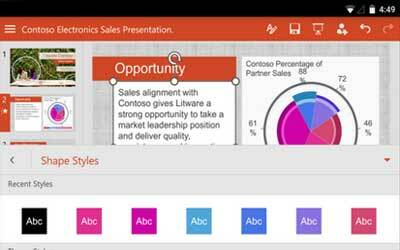 Microsoft powerpoint has been one of the most common software which is used to create presentation slides. Having that software installed in your smartphone might be a big help so that you do not have to bring your heavy laptop anywhere you go. Powerpoint for android is very much the same in its look and function. By having this mobile application, you can create and edit the presentation files with some simple clicks on your hands. This mobile application can fully save the original formatting and ensure you that you will never miss any slides, images, text, and any other formatting when you transfer it to the desktop. Through this application, you can easily get the powerpoint file from the cloud to help you with the editing. Without any doubt, this mobile application is the best on-the-go presentation mobile devices there ever is, so far. The good thing is, unlike other mobile applications which were derived from computer apps, this application is as comfortable as the dekstop version. Even though there are some adjustments made for the android version, but overall, the features and the menu options are very much the same. Once you use it, you will be easily familiar with this application. This mobile application will also enable you to save the powerpoint files in many storage software, such as Dropbox, Google Drive, Box, SharePoint, and even OneDrive. Not only will it enable you to save your files in there, you will also be able to share your files from there. Microsoft powerpoint for android will also let you to edit in potrait and landscape mode with many other features you can used, such as speaker notes, animations, transitions, and charts. Accessibility built right in: Improved support for using TalkBack, your keyboard, and other assistive technologies. Get a notification when there’s activity in your shared presentation. Love PowerPoint in all its forms. This dumbed down version is perfect for setting up simple presentations on the go. Also good for taking notes.